I enjoyed everywhere I sailed in Florida. The colours of the water (even in the ICW,) the Dolphins everywhere, beautiful places to stay like Key Biscayne, Coral Gables, Vero Beach, the Kennedy Space Center and several others. Rarely did I have to pay anything, for mooring, though I hear this is changing now. I had a great trip across the Okachobee Canal to western Florida, a very easy trip with lots of places to stay the night. I didn't have much time on the west coast as I sailed overnight directly south to the Dry Tortugas. 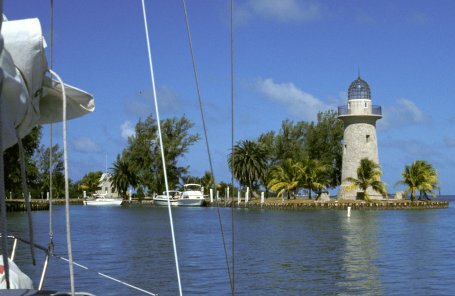 The Florida Keys are a great place to cruise. 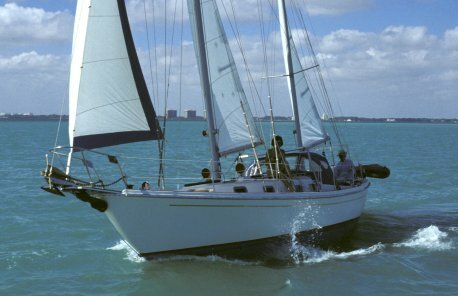 The picture shows a guy I met who now spends his life just sailing from Miami down to Key West and back and does that a few times a year for the past five years! He thinks it is the perfect place to sail as he can run his business up in Michigan from his boat and he has access to everything he needs. A girl solo sailor we met from Boston is on the boat with him in the photo. We were all sailing down to Key West.